Cranberry Pistachio Lasagna is easy, NO BAKE dessert for Thanksgiving or Christmas gathering. If you are looking for simple cranberry dessert recipe to feed a crowd at holiday parties, this delicious Cranberry Pistachio Lasagna will be a hit! After a heavy meal at Thanksgiving dinner or Christmas Eve, the best choice is light, easy and refreshing dessert. Cranberry Pistachio Lasagna recipe is simple to put together and you can make it ahead, too. When the holidays come you will be in the rush to finish all preparations on time. But for dessert you will not have to worry. You will have a delicious easy dessert ready for family gathering. Last year, before holiday season, I shared my Christmas Lasagna. That whimsical layered dessert in bright red, green and white colors became very popular. It looked so festive, but taste delicious, too. Therefore, I decided to create a new quick and easy dessert recipe. I wanted it to be simple to make as much as possible, but delicious and pretty looking as well. Again, layered dessert seems as the best option, so Cranberry Pistachio Lasagna recipe was born. Let me tell more about these delicious layers. First, there’s Golden Oreo cookie crust. It’s followed by creamy and crunchy cheesecake layer. 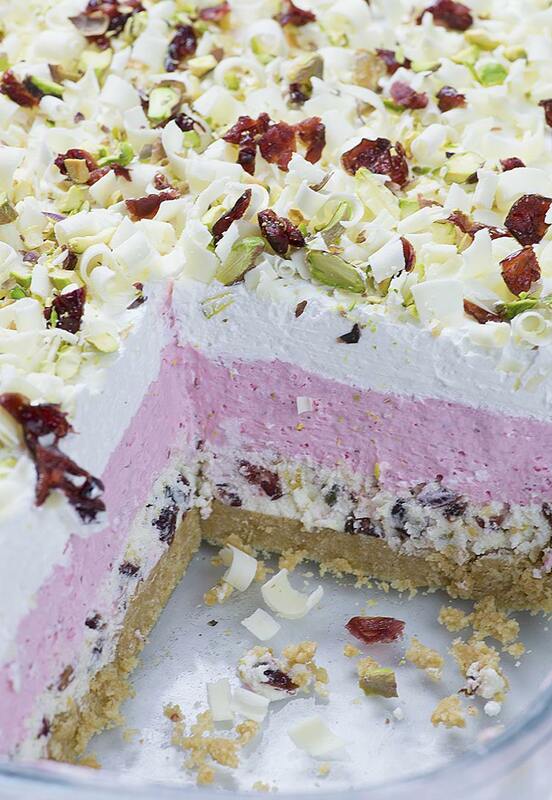 It’s mixture of cream cheese, butter, whipped cream, chopped dried cranberries and crunchy pistachios. Wow, it was so tasty on its own. I eat it with the spoon and lick the bowl! I barely stopped eating and save enough filling for the recipe. Next is pink, cranberry layer. Combo of cranberry sauce, strawberry Jell-o and whipped cream makes smooth and creamy, melt-in-your-mouth filling. 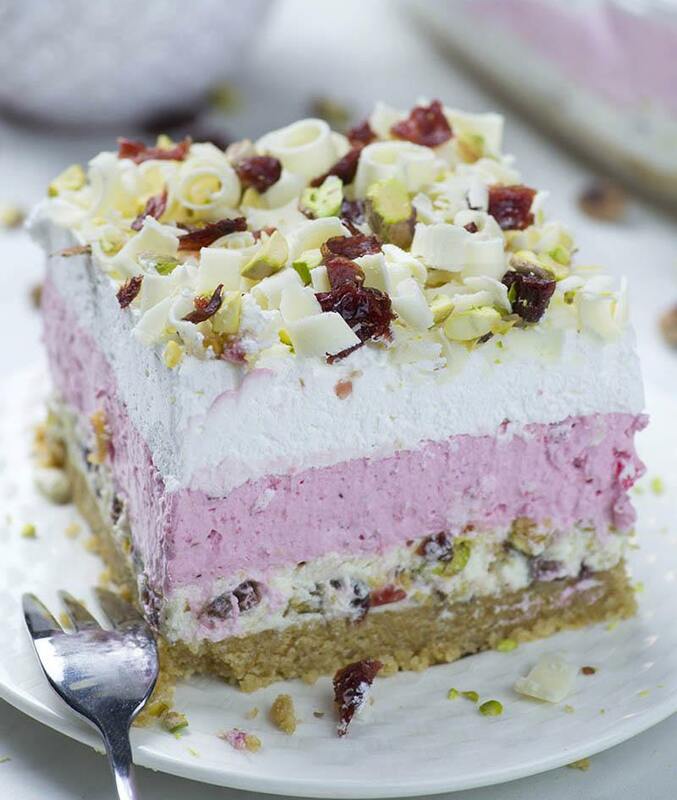 Finally, it’s topped with whipped cream and garnished with white chocolate curls, pistachios and dried cranberries. This makes it looks so special and festive! The holidays are upon us. 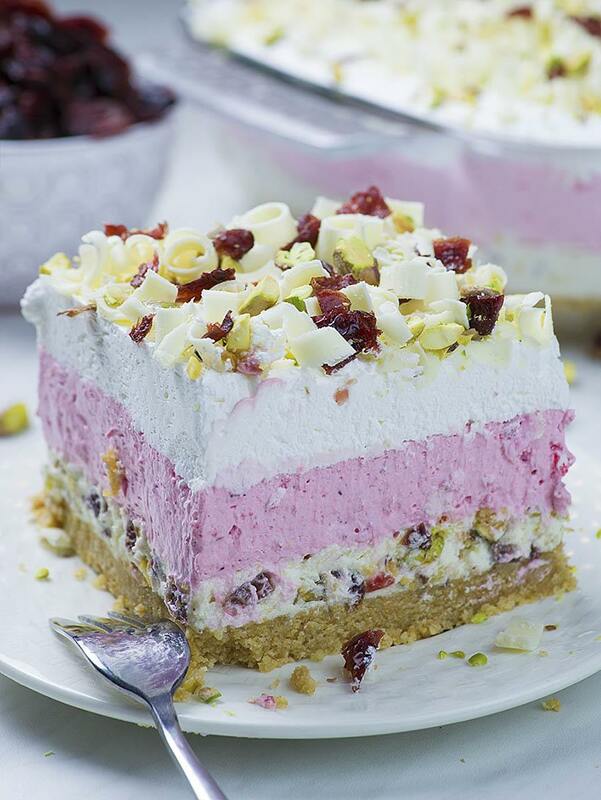 So, don’t miss a chance to cheer up your family with delicious Cranberry Pistachio Lasagna. And it’s will be awesome Thanksgiving or Christmas dessert, too! Easy, NO BAKE dessert for Thanksgiving or Christmas gathering- Cranberry Pistachio Lasagna!!! Notes: For whipped cream you can use thawed whipped topping like Cool Whip (you’ll need 22 oz.) or beat 3 ½ cups chilled heavy whipping cream with 2 teaspoons vanilla until soft peaks form. Add powdered sugar to taste and continue mixing on high speed until STIFF PEAKS form. To make the crust ground whole Oreo cookies with the filling in a food processor to make fine crumbs. Then, stir in ½ cup melted butter until evenly moistened. Now, press the mixture in the bottom of 9 x 13 inch dish, set in the freezer to firm while making cheesecake layer. In a bowl cream together ½ cup softened butter, 8 oz. softened cream cheese and 1 cup powdered sugar and 1 teaspoon vanilla until smooth and creamy. Add 1 ¼ cup whipped cream and mix to combine. Mix in chopped pistachios and cranberries, too. Then, spread the mixture over chilled crust. Place in the fridge to firm, too. In a large bowl place strawberry Jello, add ½ cup boiling juice and stir to dissolve completely. Whisk cranberry sauce until combine. Cool to room temperature and then add 4 cups whipped cream and mix until combine evenly. Taste the mixture and if it’s not sweet enough to your taste add powdered sugar. I didn’t add extra sugar, but it depends on sweetness of cranberry sauce you use. Pour the mixture over firmed cream cheese layer and smooth the top. To make the curls, carefully draw a vegetable peeler across the broad surface of a bar of white chocolate at room temperature. Sprinkle curls on top. Sprinkle chopped pistachios and cranberries. Refrigerate for 2 more hours before serving, or overnight. instead of whipped cream can you use whipped topping. 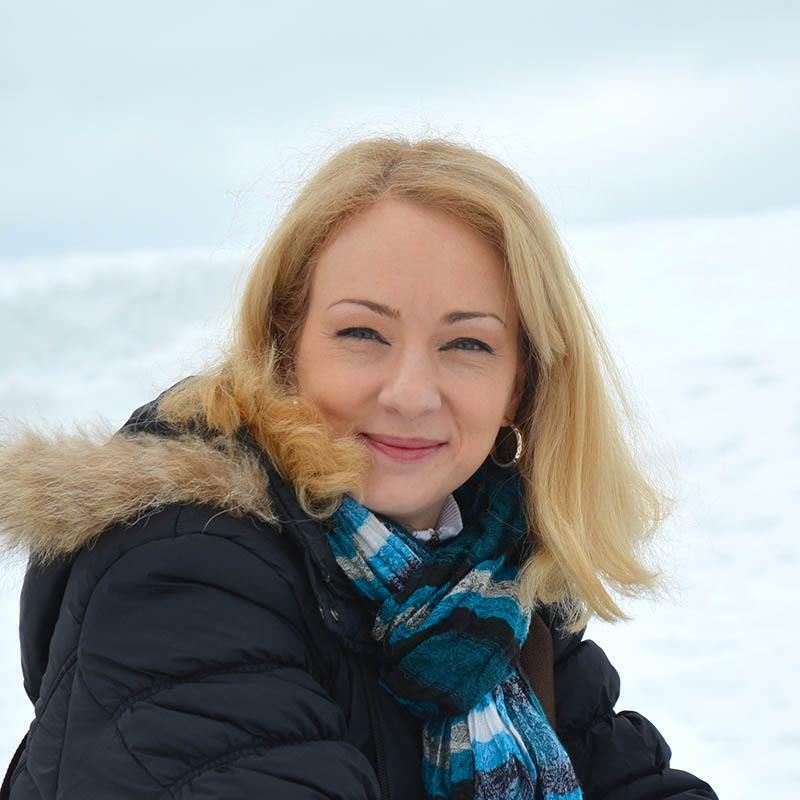 Hi Marie, you can use whipped topping like Cool Whip-thawed. Is there another jello I can use in place of strawberry my sister is allergic to them? Hi Tammy, you can use cherry or orange. You might need to add more powdered sugar if the filling turned out a bit tart to your taste. How early can I make this? Right now it’s Thursday night. I need it Saturday but do NOT have time tomorrow. Will crust get too soggy if I make it now? Hi Leslie, you can store it in the fridge for couple of days! Hi Diane, I prefer whipped cream.